I have now made a major update of this post adding more content about love, imposssible relationsships, the pillars of meaning of life and telling about my personal coinclusions. Emely Esfahani with her ted from 2017 has given me a lot of answer to the reason of my different life crisis. Every time one of my pillars broke down, I had a crisis. Look at her Ted below. Emily Esfahani Smith has made an ambitious psychological research and she tells about these pillars and about her own experience. You find the transcript of Emilys speech in Teds site to have the speech translated in your language. chasing happiness can make people unhappy. psychologists define happiness as a state of comfort and ease, feeling good in the moment. seeking meaning is the more fulfilling path. people who have meaning in life, they’re more resilient, they do better in school and at work, and they even live longer. we can each create lives of meaning by building some or all of these pillars in our lives. But when life is really good and when things are really bad, having meaning gives you something to hold on to. The first pillar is belonging. Belonging comes from being in relationships where you’re valued for who you are intrinsically and where you value others as well. But some groups and relationships deliver a cheap form of belonging; you’re valued for what you believe, for who you hate, not for who you are. True belonging springs from love. It lives in moments among individuals, and it’s a choice — you can choose to cultivate belonging with others. finding your purpose is not the same thing as finding that job that makes you happy. The key to purpose is using your strengths to serve others. Of course, for many of us, that happens through work. That’s how we contribute and feel needed. But that also means that issues like disengagement at work, unemployment, low labor force participation. these aren’t just economic problems, they’re existential ones, too. but purpose gives you something to live for, some “why” that drives you forward. Third pillar: transcendence. Transcendent states are those rare moments when you’re lifted above the hustle and bustle of daily life, your sense of self fades away, and you feel connected to a higher reality. For one person transcendence came from seeing art. For another person, it wasat churchor through writing. losing all sense of time and place. These transcendent experiences can change you. One study had students look up at 200-feet-tall eucalyptus trees for one minute. But afterwards they felt less self-centered, and they even behaved more generously when given the chance to help someone. The fourth pillar is storytelling, the story you tell yourself about yourself. Creating a narrative from the events of your life brings clarity. It helps you understand how you became you. But we don’t always realize that we’re the authors of our stories and can change the way we’re telling them. Your life isn’t just a list of events. You can edit, interpret and retell your story, even as you’re constrained by the facts. The psychologist Dan McAdams calls this a “redemptive story,” where the bad is redeemed by the good. People leading meaningful lives, he’s found, tend to tell stories about their lives defined by redemption, growth and love. reflecting on your life thoughtfully, how your defining experiences shaped you, what you lost, what you gained. That’s what Emeka did. You won’t change your story overnight; it could take years and be painful. After all, we’ve all suffered, and we all struggle. But embracing those painful memories can lead to new insights and wisdom, to finding that good that sustains you. The pillars are part of the architecture, and the presence of the pillars help us all live more deeply. Having listened to Tenzin and Emily I have now come to a few conclusions. I think it is interesting Emily grew up in a sufi family. I have myself been in contact with sufi people. My story of my pillars. I had my first pillar of belonging, purpose and trascendence as a teenager in Torino in Italy. I wanted to become a surgeon like my German uncle and I had many good friends and I fell in love 14 years old. I had also several transcendent purposes writing poetry, skying and diving. When I were 18 yeas old I wanted to write a book about life and Universe not knowing about my grandfathers project. Carlo Sessa, a Italian friend to my family, said that it was impossible to write such a book as there was far to much information to have in a book. I abandonded therefore this idea. When I were 19 years old, I loosed all my pillars, as my parents separated, I had to leave Italy laving all my friends and go back to Sweden. I could not become a surgeon as I got a bad vote in Latin and Swedish. I had my first crisis in life. I found however a pillar of transcendence and belonging joining a dance jazz group for a few years and getting in love again. When I were thirty, a new belonging pillar grew up living with my wife and family with two children in a nice and friendly neighbourhood. Because the pillar of purpose in computer programming, in my work and with www. kidlink.org from 1995, took over much of relationship time I ended up in a separation from my family and neighbourhood. I had therefore my second crisis in life with panic anxiety. I recovered however and came back to work after 5 months. The pillar of belonging to my colleagues (I epeccially remember my good friend and colleague Stig Fjellman in my school and all good friend volunteers in www. kidlink.org became stronger and stronger . It took however time for me to be valued for who I was as a teacher. the purpose of my life came to be, becoming a better math teacher attending a lot of courses for teachers <nd “Having my student to become good programmers and webmasters” writing html pages for the school and winning technique competitions. I wanted to “Make my students more intrested in math and Science” and getting better results in math. As a student coach I wanted them ” to find a goal in life and with the school”. After 10/11 my work purpose became to have my muslim students and meself better understand the Quran hopefully as a message of peace, my students finding other goals in life than joining ISIS like one of our students did dying in Syria. the pillar of transcendence. Teaching about evolution and having many discussions about it with my Muslim students and a Persian colleague, I became more and more intrested in Islam and Zoroastrism. I started to write about it in blogs. The work became to stressy because of many colleagues leaving my school to work somewhere else. My pillar of belonging became dismantled and I had my third crisis in life with mutliple strokes, mental fatigue and a third separation. I understand now that depending on the pillars of purpose and transcendence you risc to dismantle the pillar of belonging like it happened to me several times. Like my daughter reminded me about is that the meaning of purpose may hide a subconscious search for belonging and you may sometimes need collaboration to reach your purposes like I did with my programming. The dismantleling of pillars of meaning had me end up in crisis exactly as Emely tells about in her speech. As a former teacher and now a president of a no profit organization ( www.kidlink.org ) that leads school projects with the purpose to enhance a global dialog among youth, I can not avoid thinking about our youth. understand the value of relationship and collaboration (the pillar of belonging and not let their pillars of purposes and transcendence dismantle their pillar of belonging. The people in our 75-year study who were the happiest in retirement were the people who had actively worked to replace workmates with new playmates. 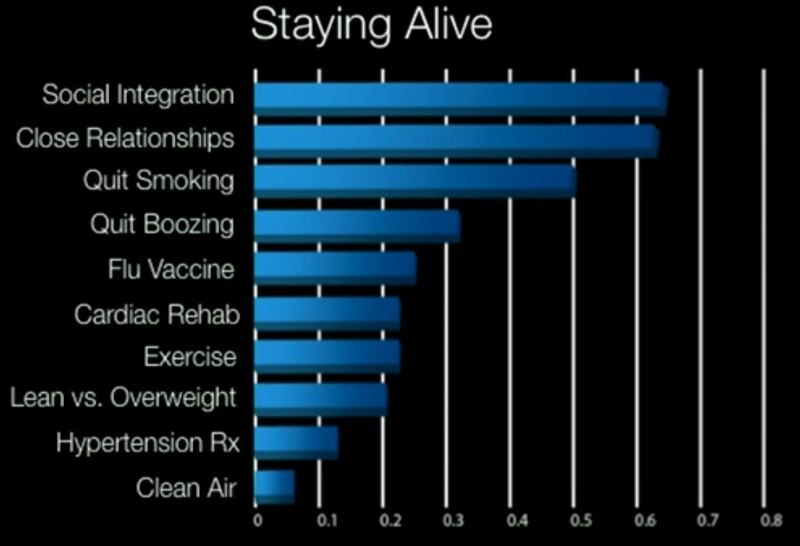 Another research about staying alive.